Pools are party central, basically by nature. They're a great opportunity to win over your grumpy neighbors or spend quality time with your extended family. And, bonus, they offer a reprieve for awkward guests like me, who answer three questions about writing or work and then hide behind the refreshments table for ten minutes. 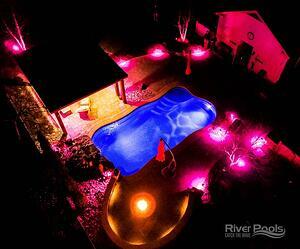 Here at River Pools, we've learned that pools bring people together like nothing else. 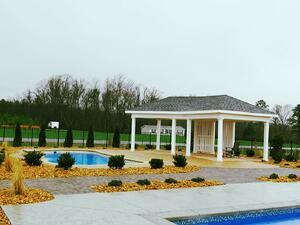 We specialize in fiberglass pools, but we're here to help you regardless of whether or not you buy a pool from us. Whether you have 3 guests or 30 (which seems like a lot to me, but still), we want to help you make the most of this bonding experience. And it's so satisfying to pull off a successful party! It all starts with the idea...and with the idea, the details to make it happen. Schedule a day when it won't be too hot and won't rain. Storms and heat exhaustion kill the party mood. On the same note, host the get-together either in the evening or on the weekend. People who work Monday through Friday want to party in the pool, too. Write out the guest list ahead of time. This keeps the number of guests manageable. And if you're cool, send actual invitations—ideally, with water/beach puns. Provide shaded areas for partygoers and for the food/drink station. Everyone needs a break from the sun at some point, plus shade will keep your sustenance in better condition. Odds are good that at least one person will need to use the restroom, and they'll probably be soaking wet from the pool. You may want to drape towels or mats on that pool-to-potty path so that no one drips all over your house. Test your pool water chemistry and all the accessories (filter, lights, water features, etc.) about a week beforehand so that you have time to fix any potential issues. Knock on wood, everything will be fine the day of the party, but you don't want to be caught off guard if a storm rolls in. Have a backup plan—another location, a tent, indoor or non-pool activities, or simply a rain date. Remind your guests to bring the basics—and pick them up for yourself if you don't already have them. I used to complain about the public-pool rules against swimming in street clothes, but it isn't just hotels being picky. Regular-people clothes can actually be bad for the pool. Dye can leach into the water. Threads of fabric can clog the drain and filter. The bacteria in street clothes can be a health hazard. Plus, the chlorine can bleach and wear out your clothes, so just wear your swimsuit. It was made for pool water. Pro tip: Hosts and hostesses should run on the assumption that their guests will forget something important. So stock up! If someone does have that issue, you don't have to scramble for supplies. If everyone comes prepared, then so much the better! You should 100% always provide drinks and snacks to your party guests. You don't want them to waste away to nothing in the summer heat. Depending on the time of day, you might want to serve an actual meal too. Alongside the sweets, serve snacks with nutritional value. Swimming is exercise, and pure sugar only goes so far. Pools are awesome by themselves, but it never hurts to include some extras. 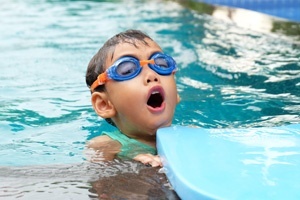 Toys and accessories make the pool itself more fun and interactive, which is super helpful if kids will attend. And hey, there's no rule saying that adults can't join in. Water balloons are a fun way to get back at anyone who splashes you, but remember that the shredded balloon leftovers will clog up your filter if left in the water. Skimping on decor is lame. But good news: you don't have to spend a billion dollars to spruce up that party. A few key pieces count for a lot! Browns and blacks have no place at a pool party. Any decor should be white or brightly colored to follow through on the summer vibes. Outdoor lights look lovely, plus they extend your party time past dusk. Party hearty, my friends! You can adjust your aesthetic with the type of lights you pick: Tiki torches, sky lanterns, and twinkling lights all have different looks. Themed centerpieces create simple, small accents that bring everything together. And you can customize them to fit your theme! Flowers add to the oasis feeling, especially if you can get hibiscus. Seashells evoke, well, the sea. Obviously you'll need regular-size tables for the drinks and food—but consider setting out small tables around the chairs and benches. This will give your guests somewhere to set their food, drinks, and whatever else they might be carting around. Bonus: more opportunities for cute li'l decorative centerpieces! You may already have oversized umbrellas set up with your patio furniture. They're iconic, and they help provide the shade you need. Mason jars give a Pinterest-y, beach-casual look to your pool party. You can use them to hold decorations or to drink from—probably not at the same time. Caution: these jars (and anything similar) should be plastic, not glass, so they won't shatter if dropped. Say hello to the Beach Boys and Hey Ocean! A playlist with fun, summery music will add to the ambience. If you don't have one already, you can find them pre-made on sites like YouTube, Spotify, and 8tracks. Pool parties are fun. You know what else is fun? Safety! Broken glass is no good in any situation. We know this. But if it falls into the pool water, it can be almost impossible to find. Patios can be slippery, so better safe than sorry. Keep an eye on the young'ns, especially those small enough that they have to stay in the shallow end. Hire your local teenager as a temporary lifeguard if you don't want to do this yourself. You should already have a backup plan in case a storm approaches. Take a rain check; you don't want anyone to get hurt. Pool water attracts lightning like they were the only young people at a speed-dating event. It's hard to imagine anyone turning down a pool party invitation because the pool was "beneath them." How bad would that pool have to be? We're there to enjoy the sun and swim. Still, fiberglass pools lend themselves especially well to pool parties. Most models include bench seats, and some have a tanning ledge as well. (Fun fact: these features are included in the pool price, not extra, because they're built into the mold design.) They're awesome for the partygoers who want to lounge and socialize partially in the water rather than play in the water. 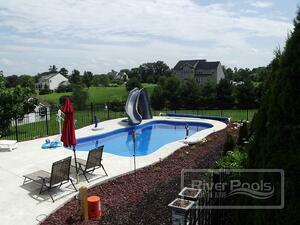 Fiberglass pools also have a smooth surface, unlike concrete pools. You don't have to worry about party guests scraping their skin. Yay for guests leaving your place in one piece! If I can be a little superficial for a moment, fiberglass pools also look good. 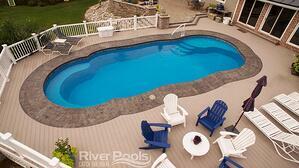 Vinyl liner pools tend to look a little cheap, and that's because they are. 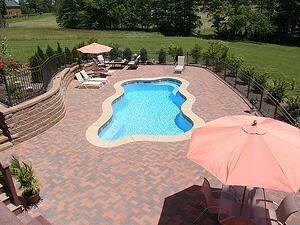 By contrast, fiberglass pools come in many colors and can be designed to match any aesthetic. One common concern is that fiberglass pools aren't big enough for a party, since they only go up to about 40 feet long. But in reality, that's not an issue! Any pool over 35 feet long accommodates a lot of people—and given the patio and the grill, it's rare that more than half of the group is in the pool at any given time. River Pools is a fiberglass pool manufacturer and installer near Richmond, Virginia, with certified dealers across the country. We're enthusiastic about fiberglass pools because we've found that they give pool owners the best experience possible—and customer satisfaction is our priority in everything we do, even if it means you don't buy from us. If you'd like to learn more about pools, take a look at our unbiased comparison of the three pool types, and feel free to get in touch with us if you have any questions. We'd love to help you on your pool journey! Next: When Should I Close My Pool for the Winter? Editor's note: This blog article was updated on November 7, 2018.